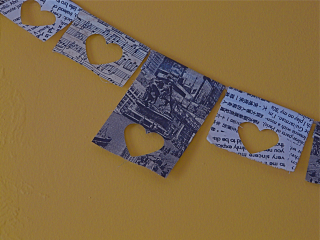 Last week I saw on Chicago Apartment Therapy and then on bb-blog the fabulous heart flag garlands designed by Cori Kindred. 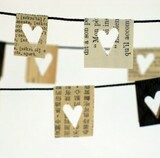 Her garlands are made of vintage paper and really are so wonderful. Looks like she sold out of them in her Etsy shop (see her image at right - you can click on it to enlarge). There are larger pictures here and below. Sorry about the craziness of my mantle. I have Aidan rocks (he gives me rocks and pebbles from every place he visits), Ephraim pottery, a dusty clock, dead daffodils, chalkboard Valentines from Aidan and paper Valentines! This is a Flickr badge showing public photos from SassyPriscilla tagged with heart. Make your own badge here. Love this idea! I'll be linking today! Your banners are great and I love the way you work out various details of making them. you are the queen of garland!